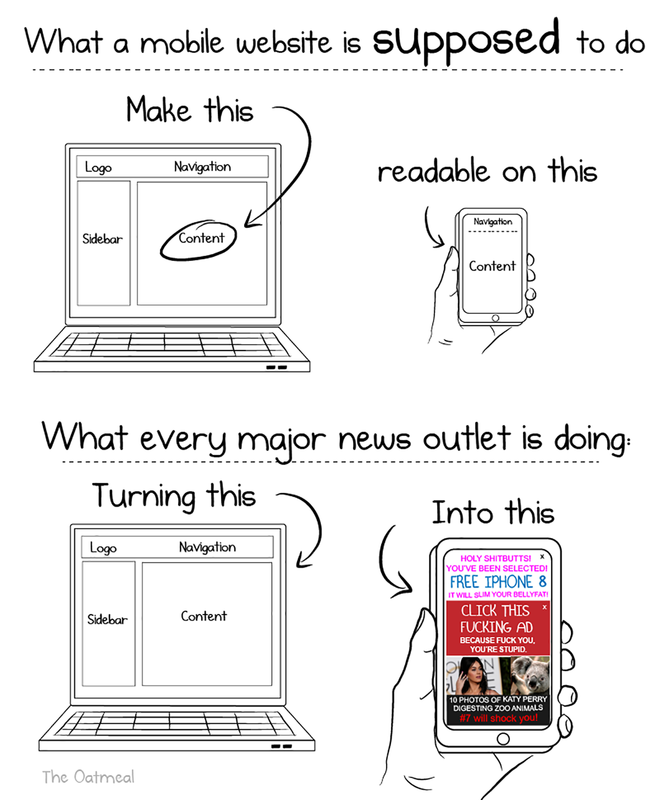 There’s a Click Bubble, and it’s about to burst. Ready? The bad news: the largest advertisers in the world are pulling their budgets. The world’s biggest publishers have declared an ad-free future. Facebook is punishing traffic that doesn’t generate discussion. EU regulation will soon massively limit data collection. And much more. The online attention economy is collapsing in on itself. The good news: a new, audience-first model is emerging that benefits everyone involved, whether you’re a publisher, blogger, advertiser, or network. How you keep up will make or break your business. I’ll walk you through both sides. Bubbles seem large and solid, but are fragile and hollow. It’s the perfect term for markets that grow through unchecked hype, and inevitably burst. It’s also well-documented that for all who lose, after every bubble burst there are some who, inversely, disproportionately gain. The Click Bubble is next and it will be no different. Will you be a loser or a winner? Let’s start with an important primer of how we got here. 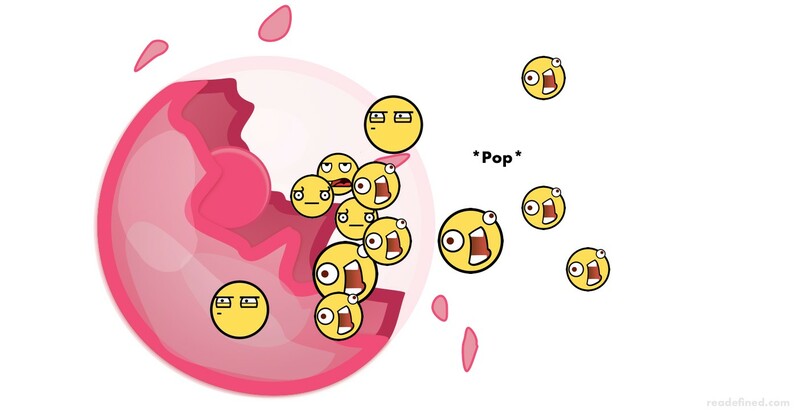 All bubbles follow the same fundamental recipe. It’s as simple as 1, 2, 3.
this case, it’s not just the Internet, but attention on the Internet. 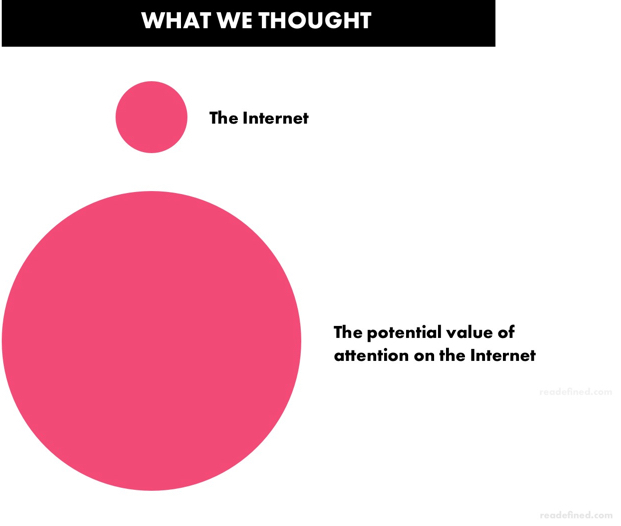 It was the fundamental idea that attention online would be 1) equal to TV and print attention, but even bigger, much cheaper and 2) much more measurable. In hindsight, we’re finding out now that those core assumptions were very naive. It wasn’t just our flawed assumptions that doomed us — it was our simplistic standards for what constituted attention online. All you needed for an “impression” was to load a page. For confirmed value? A simple click. If you clicked something, it equaled meaningful, bankable attention. Both impressions and clicks have dollar values — and they represented an accessible, unregulated gateway to the eyeballs of the world. With such a low threshold for something so potentially valuable, the ecosystem rapidly devolved into a click-baiting Wild West. 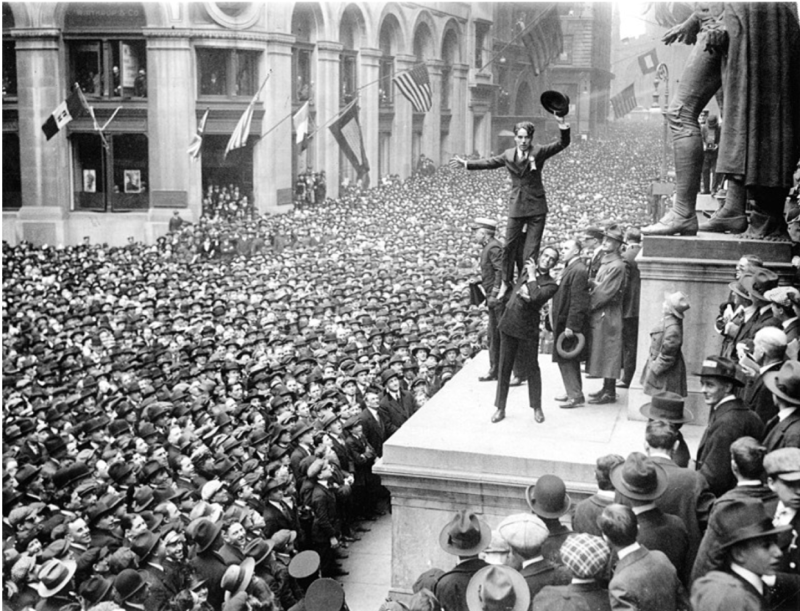 Speculators poured in, trying to stake their claim. A gap started forming between the perceived value, and what was actually being delivered. 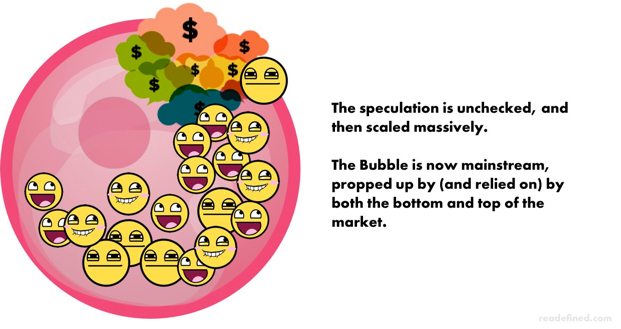 The Bubble was born, carrying the $357B publishing industry and future social media giants on its back. This is when things started getting out of hand. Despite the internet evolving closer to its current form — overwhelming choice and substantially more discerning users — the original flawed assumptions were only doubled-down on. What if you could set up entire networks to scale and automate all these click-based slices of “attention”? Imagine the revenue potential! Which sounds a lot more efficient and effective than the system actually is. In reality, because it’s based on the same fundamentally flawed standard of attention, programmatic networks only helped massively scale inefficiency and false value. Or, put another way, it added countless layers of complexity to a rotten core, making it virtually impossible to trace or fix. Attention-based marketplaces (ad networks and social networks) exploded in size — and with them, the gaping chasm between actual value and perceived value. Seeing the stupendous money pouring into the system, and the sheer volume claimed, traditional corporations piled on, with media agencies in tow. The real value had barely grown, while the perceived value was now propping up entire industries, from Advertising and Marketing to Publishing and Social Media … with enthusiasm the only thing actually holding it all up. What’s more, attempts to better qualify all this attention have been extremely thin. Does that sound like bankable attention to you? 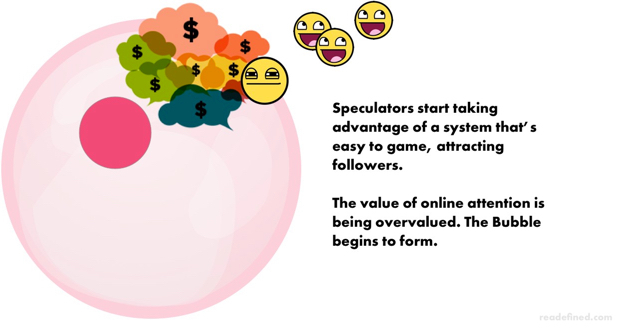 Sensing the market has gotten out of hand, the original speculators move on. Billionaire ex-Facebook president Sean Parker admits he helped build a monster, worrying it’s rotting children’s brains. Meanwhile, early Google and Facebook investor Roger McNamee compares the effects of both to nicotine, alcohol or heroin, and the Co-Founder of Twitter declares “The internet is broken”. The followers, now including the mainstream market, begin pushing back. So the key players who were propping up the market from the industry side begin pulling out. For context, you could buy 1.2 trillion online ads with Procter & Gamble’s digital marketing budget, or create 34,285 new marketing jobs, each with an annual salary of $70,000. Piling on, Unilever, the world’s second largest advertiser threatens to pull its massive advertising budget, too, from networks which create division in society (hint: by prioritizing clicks-at-any-cost). Meanwhile the Global Media Manager of American Express calls out viewability standards in general. The rising public displeasure invites regulatory intervention and mass media scrutiny. This May, a new law from the European Commission will make 3rd-party cookies extinct and significantly affect the ability of companies everywhere to collect and leverage user data in general. Various world leaders speak up, as well, about additional regulation, and the media is relentless, with every major outlet weighing in. While evidence rapidly mounts that there literally is no defensible value. “They accidentally opened Pandora’s box,” said Jon Bond, co-chairman at full service digital agency The Shipyard, about JP Morgan Chase’s recent experiment. “They were looking at brand safety and boom — the performance box pops out. Finally, the behemoths themselves — the bedrock of the system - start reacting. After shifting to much more specific campaign tracking, Facebook also makes a dramatic change to the heart of its system, announcing its algorithm will now punish content that doesn’t generate meaningful connections between users. Then Google — arguably the creator of modern online advertising — implements a built-in ad blocker to its own popular Chrome web browser. ... this is a feature that no ad-supported media company can ignore and one whose introduction could have, almost overnight, a material impact on how people experience the web. All of the above has taken place over the last 12 months. If any of this surprises you, it shouldn’t. The internet ecosystem has been due for a correction for a very long time. While the chorus identifying social networks’ roles is more recent, the overall ad side is nothing new. As far back as 2008, studies were already showing half of all clicks on display ads were worthless. Ad fraud was obvious in 2009, proven systemic in 2012, with the entire ecosystem deemed ineffective in 2014, and destructive in 2015. In 2016 truly massive scams were already being uncovered (‘Biggest Ad Fraud Ever’: Hackers Make $5M A Day By Faking 300M Video Views), last year was no better, and it’s all predicted to only get worse — to the tune of $50B per year. Does this sound like an ecosystem that can solve the situation as currently structured? In a nutshell, the current system is a perfect storm of fraud, poor delivery (unhappy users), and ineffectiveness (unreliable data, unreliable performance, and now stifling regulations). 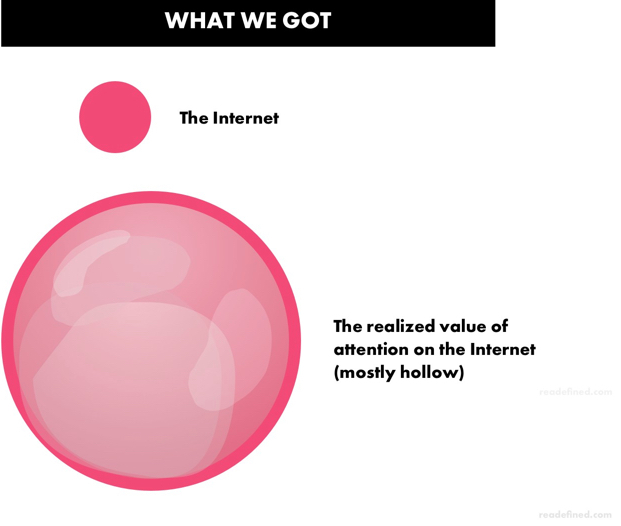 The reality is that the future of the Internet, and attention online, will be about deeper engagement. Why? Because it generates much more concrete data for decision-making, and because it leads to more user trust — and that trust has value, whether it’s a lasting subscription to you, or more favourable appraisal of your ad partners. A few seconds of attention and maximum clicks will no longer be the name of the game. A loyal user who attentively soaks up your content, and even gives meaningful feedback, is the new holy grail — not just for Editors but for the entire future online economy. So how do you secure that kind of deeper engagement? A superior UX (User Experience). 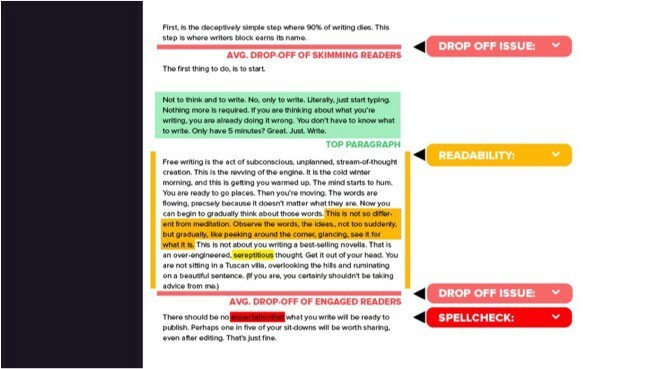 The UX of content: don’t just publish articles. 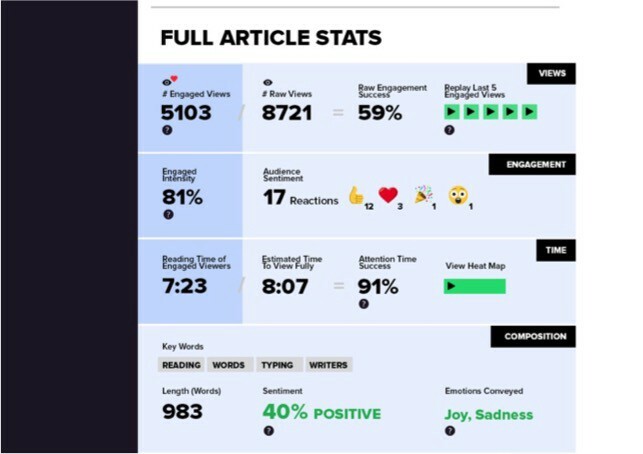 Publish content experiences. If you need inspiration, take a look at the NY Times annual travel list. All you need is a little code and design help, and the rest is creating and sourcing raw content that is personal and compelling. Clickbait is a dead-end. When a visitor is done with your content, they shouldn’t feel duped, they should feel rewarded. Add interesting polls. Include compelling GIFs from just about any video. There have never been more easily adaptable plugins and resources available to create a deeper experience, as there are now. The UX of discovery: guess what? You can’t create all the content your audience might want to look at. You can’t keep them around forever, no matter how good your recommendation algorithms. People will go to other publishers and sources for their reading and entertainment. And its time to embrace that. 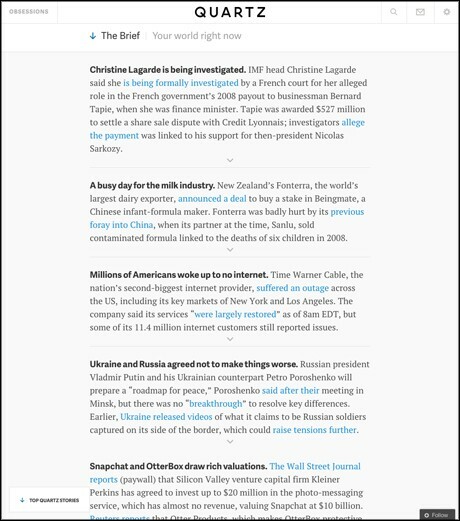 Quartz did with its Daily Brief, popularizing the nearly sacrilegious idea that it’s okay to direct readers to content that you didn’t create / isn’t on your site. And it went extremely well. So well that you may have noticed nearly every publisher has scrambled to emulate it. Why is it so effective? Because it builds trust. Readers will begin to trust that not only do you produce good content, but if they stick with you, you’ll also help them find the best content from everyone else. What’s losing somebody to another site right now, but gaining their loyalty for a lifetime of website visits and newsletter receipts? When the paradigm shifts from short-term clicks, to long-term engagement, your priorities should shift, too. The UX of Data: As the CEO of Axel Springer pointed out, there is a tremendous opportunity to flipping the script and giving users control of their data. Part of his motivation likely is that the new GDPR law from the EU will also make this less of an option, and more of a requirement — and this applies to you as well. Ultimately, more than anything, this is an opportunity to stand out from the traditional social networks who give users very little in the way of customizing how their data is catalogued and manipulated. Giving your users control of their data can take on many forms. Perhaps users would be grateful to volunteer their data if it was selective, transparent, and corresponded to relevant rewards. If you’re the most dedicated reader of Business articles, perhaps you deserve 25% off from a subject-relevant ad partner. (This is an approach we are exploring with an upcoming addition to Readefined.) Alternatively, users may prefer the option to trade something else in, like the spare processing power of their devices, for example, in exchange for a tracking/ad-free environment, as Salon is offering with a recent crypto-mining experiment. The possibilities are endless, they just require a little bit of creativity — with the underlying opportunity that you can turn your passive readers into proud community members. Advertisers: wean yourself off volume-based campaigns, and focus your energy on helping be part of that deeper audience engagement. How can your campaign help that? If you can answer that question, you’ll have win-win results. The easiest approach to this today is focusing on quality sponsored content instead of programmatic display ads. Networks: do as Facebook is (surprisingly) doing, and shift your focus to features that maximize engagement between community members, rather than just focusing on maximum consumption. Intra-community engagement is part of the deeper engagement experience. So the internet is a dubious, overwhelming cesspool? Great, you just need to be a bit better, and you’ll already stand out like a veritable hero. In Marty Neumeier’s business strategy book, ZAG, he puts it simply: “If everyone else is zigging, you zag.” Right now, everyone is complaining about garbage data, because of dubious traffic, all through systems they have zero visibility into. So go in the opposite direction. Better data: if you’re still working around simple metrics like clicks, you’re burning money and wasting time. Focus on measuring conversion, i.e. not just clicks, but how clicks became specific actions, such as a reaction, or a specific purchase or a specific download. Facebook now even allows you to track campaigns against your offline revenue. With Readefined, we focused on making conversion tracking as easy as possible for content creators because of how clearly the expectations are shifting in this direction. More credible traffic: it’s no longer enough to depend on a few metrics, in isolation. They are hard to assign value to and are easy to game with bots. In our case, we created technology which looks at human behaviour patterns to understand how intensely the visitor was actually paying attention to your content in the first place (and what you can do about it). Visibility: have no clue what’s going on behind the scenes? No idea what you’re actually selling or paying for? Don’t stand for it anymore. Either provide, or demand, a way of seeing how you calculate performance. This trend, thankfully, seems to be picking up. With Readefined, we made sure you can take any of your content or campaign data, and share it in a sleek dashboard with anyone. In all cases, you should be able to charge exponentially more for quality, in a way that outperforms charging less, linearly, for quantity. Can they enhance your reach? Of course. Should you be totally dependent on them? No. Publishers and bloggers are increasingly looking at carving out their own online communities in this new world where concentrated, distilled engagement is the winner. The Internet is shifting. Which side of history will you be on? Whether you believe there is a Click Bubble or not, it is irrefutable that the Internet is not well, and market expectations are rapidly changing. Play your cards right, and you can guide that change while saving your business. In the bigger scheme of things, however, this is bigger than just profits and losses, it’s about the impact on society. How will we choose to value the information backbone of our modern world? What part will you play? That’s the question my team asks itself every day, and what motivates everything we do. If you found this post helpful, and want to read more like it, all I ask is that you subscribe, share this post, or sign up at Readefined.com. 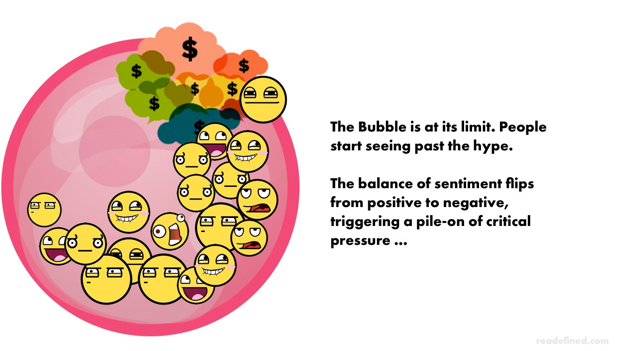 This post is based on the presentation “The Click Bubble Is About to Burst”, delivered at the World Publishing Expo, October 2017.